Uber Luxury: Xavier Dietlin, a visionary innovator of the Luxury industry. Salon International de la Haute Horlogerie, or SIHH, kicked off this year’s conference for fine luxury watch makers in Geneva, Switzerland. The 24th annual event showcased displays of fine watchmakers from around the world in a stunning array of new products, technologies, and marketing techniques. The unique and creative (not to mention technologically impressive) artistry of the displays created by Xavier Dietlin of Dietlin Artisans Metalliers Depuis 1854 rocked the corners of SIHH and garnered much attention from the attendees and visitors to the conference. His first display featured a visual detector that prompted the 3D holographic program to begin as a visitor approached the console. The simple box no doubt held a complex array of lights and speakers that created the audiovisual masterpiece that appeared before those watching; 5 years of research was put into this particular project, a revolution in both marketing and technological prowess for Xavier Dietlin. This display showed the Excalibur Quatuor watch and took viewers through a stunning array of holograms showing the durability, density and master craftsmanship of the piece. This smart holographic showcase was for Roger Dubuis and perfectly captured the character and feeling of the brand in a new and exciting way. The second piece of digital craftsmanship was a holographic motion capture system designed for Greubel Forsey. This structure allowed viewers and visitors to directly manipulate the display with a simple wave of their hands. The 3D hologram allowed visitors to view individual components of the Greubel Forsey watch that was displayed as well as zoom in and out; by manipulating the display users could see a 360 degree view of the watch and its individual parts in incredibly close detail. In a final feat of technological mastery Xavier Dietlin created the Hublot Sphere in anticipation of the 2014 World Cup football games in Brazil. Pele, a dominant feature of the Brazilian team and known around the world for his football prowess was prominently featured in the short display. A sphere showed clips of Pele surrounding the Hublot watch, which was alternately emphasized by a spherical representation of the Brazilian flag and other football moments in history bringing positive attention to the upcoming World Cup games in Rio. The stunning graphics display provided a new kind of holographic wonder for viewers to enjoy. Xavier Dietlin’s work with the displays at the 24th annual SIHH conference proved once and for all that there is truly a technological and digital revolution occurring in the world of fine watches and timepieces. A leader in his industry, Xavier Dietlin has caused quite the stir among those looking to bring attention to their brands in new and exciting ways. Embracing new technology is guaranteed to transform traditional brands into brands of the future; the luxury industry will continue to benefit from the work of people like Xavier Dietlin who are proving to be essential to the success of members of the luxury watch industry. We had the opportunity and pleasure to take a closer view of Xavier's passionate journey and thoughts on luxury, his business and his own personal and professional journey to where he is now. 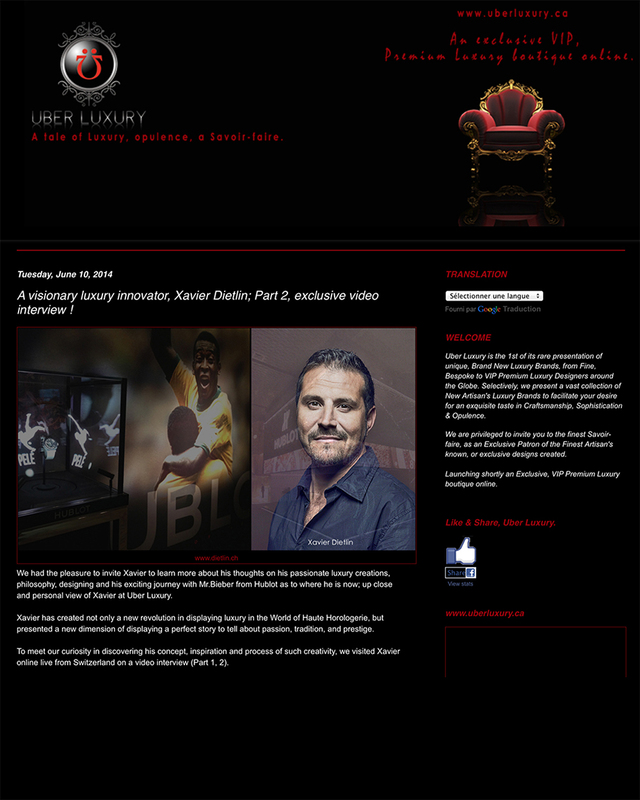 Stay tuned, where Uber Luxury brings you an exclusive interview with Mr.Xavier Dietlin. 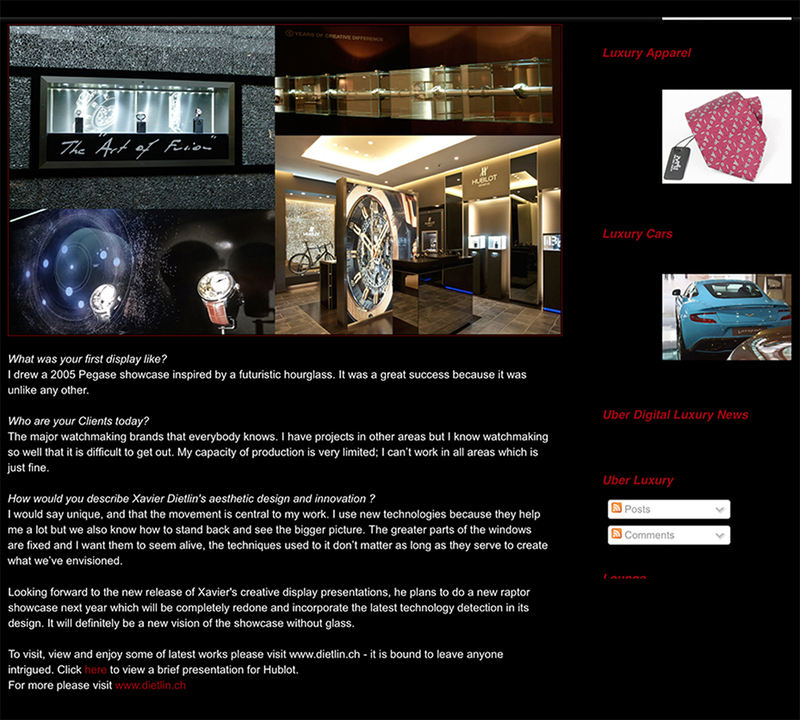 A visionary luxury innovator, Xavier Dietlin; Part 2, exclusive video interview ! We had the pleasure to invite Xavier to learn more about his thoughts on his passionate luxury creations, philosophy, designing and his exciting journey with Mr.Bieber from Hublot as to where he is now; up close and personal view of Xavier at Uber Luxury. Xavier has created not only a new revolution in displaying luxury in the World of Haute Horologerie, but presented a new dimension of displaying a perfect story to tell about passion, tradition, and prestige. To meet our curiosity in discovering his concept, inspiration and process of such creativity, we visited Xavier online live from Switzerland on a video interview (Part 1, 2). In addition, an inquisitive attempt presented an opportunity of a step further about Xavier's journey. I took over the business from my father who made doors and windows. I was not passionate about the field of construction and following a project for Cartier, I decided to steer the company to watchmaking. What could be more exciting than an object of 40mm diameter which tells all stories? We also produce small buildings in miniature called showcases, which were featured at the SIHH. 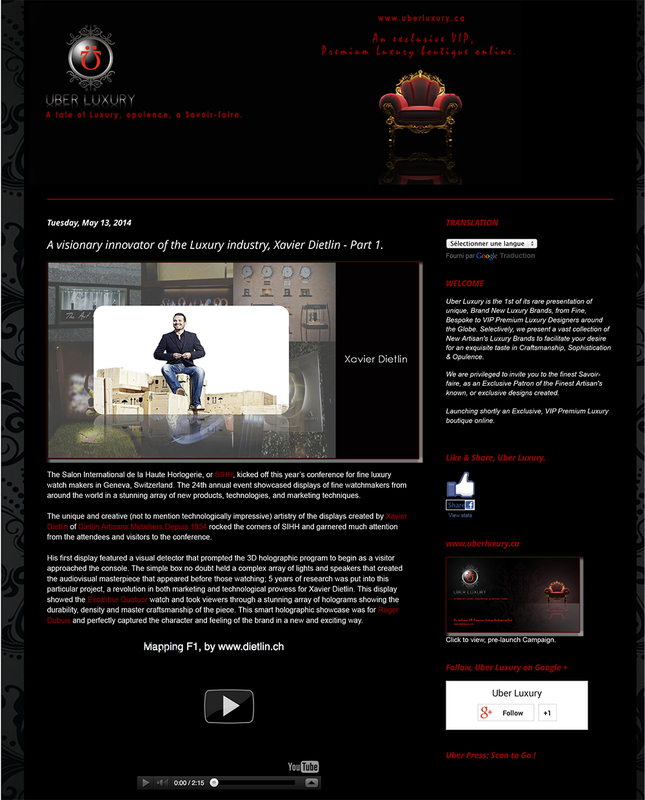 How do you perceive luxury? For me the luxury has two opposite faces- the bad one is people who want to show they have money and the good one is the amount of work it takes to produce these extraordinary objects. The idea that hundreds of operations are required to manufacture a watch is fascinating. What is the difference between fashion, couture and luxury to you? These areas have much in common, but luxury to me is appreciating beautiful things for what they are and not for what they represent in the eyes of others. This is valid for all beautiful things that men manufacture. Are you involved in the luxury process from the beginning? I am often involved in the luxury process from the beginning but very often my clients call me because they need their product to be revitalized. Products are often “dead” in the windows and I have to make them live. Luxury is irrational. The majority of watch lovers don’t buy a watch to give them the time; they buy it for the craftsmanship and design, because they appreciate that aspect of luxury. What drives the excellence of your designs and presentations ? Inspiration comes from the things around us- observe and reinterpret, then create. French filmmaker Claude Lelouch says that music should be the first thing you do in a movie and images come next. Listening to a Radiohead song, for example, can only inspire you! I realized some time ago that all my ideas were made during my holidays and this is the time of year when I am immersed in my records. How did your professional, academic and your innovative career evolve ? I did my studies at the School of Arts and Crafts in Bern in Switzerland and trained as an industrial designer, but what I do today has nothing to do with what I learned. After playing professional football I took over the business from my father that I redirected to watchmaking immediately. What is most important aspect to you during your design process? To remain faithful to my ideas. For me the important thing is not how you make a window but why? The function is the most important thing and the design has to serve this function. The English word “showcase” is the best explanation about what it is: a show box! What was your first display like? I drew a 2005 Pegase showcase inspired by a futuristic hourglass. It was a great success because it was unlike any other. Who are your Clients today? The major watchmaking brands that everybody knows. 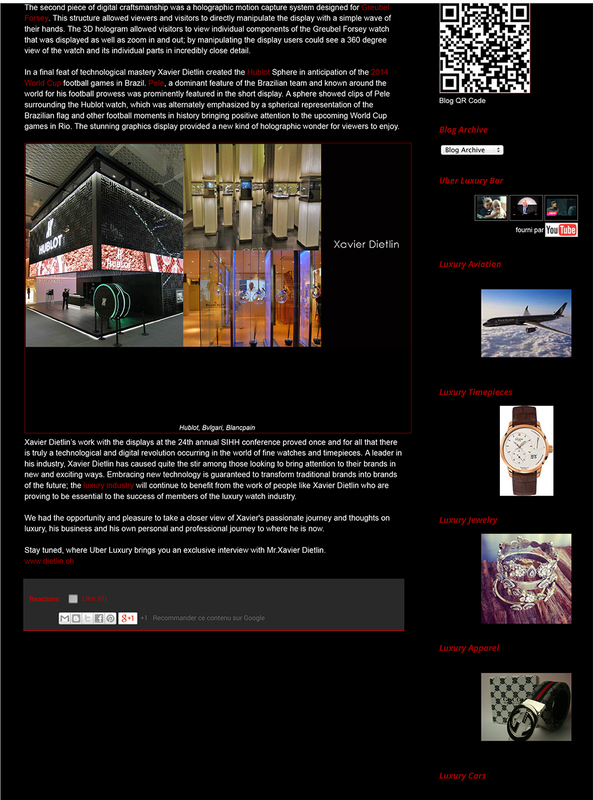 I have projects in other areas but I know watchmaking so well that it is difficult to get out. My capacity of production is very limited; I can’t work in all areas which is just fine. How would you describe Xavier Dietlin's aesthetic design and innovation ? I would say unique, and that the movement is central to my work. I use new technologies because they help me a lot but we also know how to stand back and see the bigger picture. The greater parts of the windows are fixed and I want them to seem alive, the techniques used to it don’t matter as long as they serve to create what we’ve envisioned. Looking forward to the new release of Xavier's creative display presentations, he plans to do a new raptor showcase next year which will be completely redone and incorporate the latest technology detection in its design. It will definitely be a new vision of the showcase without glass.